Being the first day of a new year, it is natural to reflect on the events of the past year and consider what the upcoming year may bring. The Guild certainly had an active 2017! We sponsored two evening presentations at St Bernard’s, discussing Medical Missions in May and a Catholic perspective on Physician Assisted Suicide in September. Both events were well attended and most successful. We cosponsored Peter Colosi’s talk on Euthanasia in August as well. 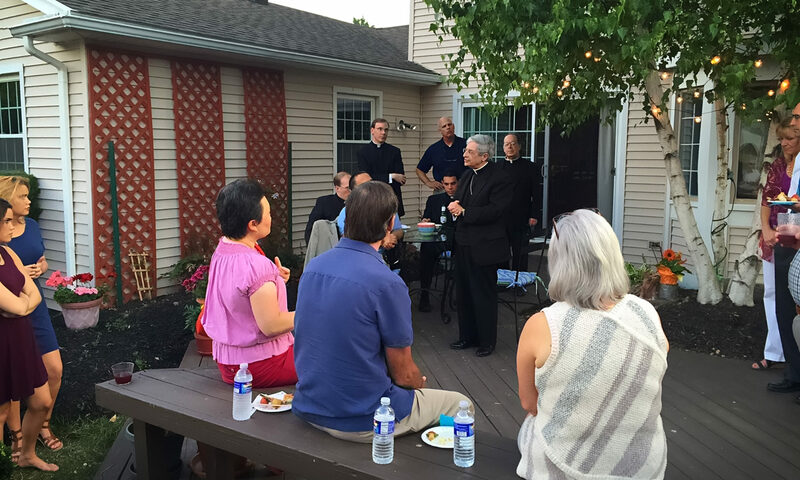 Our annual summer Soiree was a most pleasant evening marked by beautiful weather and gracious company. I especially enjoyed being able to introduce our Guild to Physicians, Nurses and Healthcare workers who were not previously aware of our presence in the community. As you may know, the Guild is a Chartered member of the Catholic Medical Association. The CMA is a national organization that attends to a myriad of concerns on a wider scale than any local Guild could possibly achieve. The CMA sponsors a Mid Year Forum that is focused on building stronger Guilds. I was able to attend this meeting for a second year in a row, and continue to find it a valuable investment of time. The main event of the CMA is their annual meeting, this year held in Denver. The theme was “Medicine at the Service of Marriage and the Family”. The topics addressed were wide ranging, from the Truth of the Human Person to avoiding Burnout to NFP to Bioethics to the Cultivation of a Healthy Society, among scores of other presentations. Fellow Board members Jean Parker and Angela Maupin were able to attend as well and we were able to network with many other Guild and CMA members from thoughout New York State. A highlight during the conference was the announcement that the New York Appellate Court unanimously rejected the argument that PAS is a constitutional right. Our Guild is always looking to grow in membership and increase it’s visibility in our area. Our intent is to make our evening programs of interest to our Catholic community, as well as the community at large. We reach out to our Medical Students and Residents, as well as other health care students, to inform them of our presence and serve as a resource to them on their personal and professional journeys. We hope to sponsor a Physician in training to attend the CMA’s Boot Camp this upcoming summer. We have sponsored tables at the Rochester Men’s and Women’s Conferences to introduce ourselves to those audiences. Our Board is active and committed in the pursuit of making the Guild relevant to our community. I am sorry to say that our Vice President, Ellen Dailor, M.D.. will be leaving the Rochester area for a new position in Florida. We will miss her greatly. I am thrilled, however, to welcome four new members to our Board in the near future. Drs. Angela Maupin, Thomas Carroll and Bryan Stanistreet and Sue Moncynski, RN will bring a healthy, young energy to the Board, which we will all appreciate. Looking ahead to 2018, I am excited to announce that the Finger Lakes Guild, together with the Buffalo and Syracuse Guilds, will be sponsoring a day long conference entitled “Catholic Perspectives on Modern Day Health Care” this May 5, 2018. We have an outstanding schedule of speakers, including Wesley Smith J.D., Anne Nolte, M.D., Father Robert McTeigue, S.J., PhD., and Thomas Carroll, M.D. The event will take place at the RIT Inn and Conference Center and will include celebration of the White Mass. Please be sure to mark this on your calendar today and look for further information on our Website in the upcoming months. It has been a privilege to be involved with the Finger Lakes Guild and I look forward to working with you as we undertake new endeavors this upcoming year. For your part, I would ask you to stay involved. Join the Guild (see our website to access the 2018 membership form). Come to our events. Talk to a colleague or student about us. Invite them to join the Guild and attend one of our events with you. And by all means, join us in prayer that the Guild will continue to grow and be successful in all it’s endeavors!